In this new landscape of healthcare, physical activity trackers have become a focus in both research and practice, as they can provide many benefits ranging from empowerment and people taking responsibility for their own health to opportunistic engagement in desired behaviors . 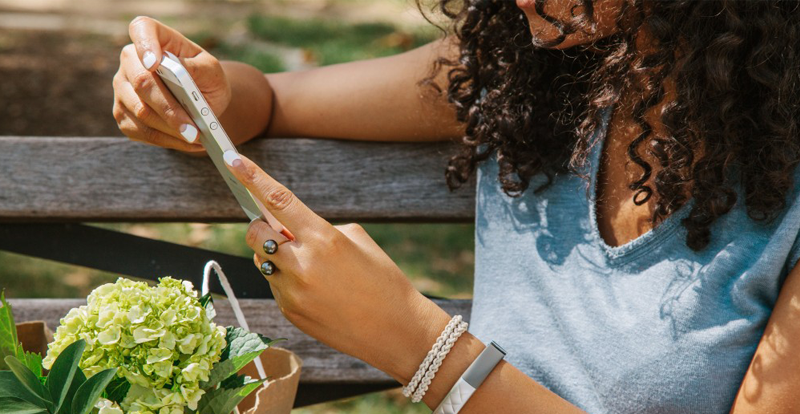 The market for wearable activity trackers such as Fitbit, Jawbone up, and Nike+ Fuelband has seen a rapid growth, estimated to have grossed $1.15 billion in 2014. Karapanos, E. (2015) Sustaining User Engagement with Behavior Change Tools, Interactions 22, 4 (June 2015), 48-52. Despite significant recent advances, one could argue that research and practice in behavior-change technologies are still in their infancy. The industry is currently following a technology push paradigm, appealing to the user’s interest in experimenting with self-quantification. In research, our efforts are continually expanding to different sensor technologies and different uses of them, as if we have actually been successful in developing behavior change strategies that work. The reality of behavior change technologies, however, is somewhat disappointing. A recent survey found that over a third of owners of commercial physical-activity trackers discarded them within six months . The reality is even worse for activity-tracking mobile apps, where adoption is often more exploratory, and for researchers who typically deal with exploratory ideas and prototypes that are necessarily less developed than commercial products. For instance, in our own work we found that out of the 86 users who installed a physical activity tracker that we deployed on Google Play, only 21 percent of them kept using it for more than two weeks . Ensuring long-term engagement with behavior-change tools is important for a number of reasons. The majority of today’s behavior-change technologies rely largely on the principle of self-monitoring—the idea that monitoring our behaviors makes us more likely to engage with behavior change, be it walking the extra steps, reducing our energy consumption, or other changes. Research has repeatedly shown, however, that individuals quickly relapse into their old habits once self-monitoring ceases. The question we pose in our research is how to sustain user engagement with behavior-change technologies (and the behavior-change process per se) over a prolonged period of time. We now describe some of the different paths we have explored so far. Creating checking habits. The question we are asking here is: How can we design behavior-change technologies that entice users to keep checking their data? Recent work has highlighted the capacity of smartphones to create strong checking habits —“brief, repetitive inspection[s] of dynamic content quickly accessible on the device” . Powered by instant information rewards found most commonly in social media updates and incoming emails, these brief interactions, lasting fewer than 15 seconds, have been found to account for as much as 40 percent of our usage sessions with smartphones. On one hand, the potential for checking habits to transform into addictive behaviors is alarming. On the other hand, checking habits can also serve a good purpose—for instance, if they sustain user engagement with an application that helps them to exercise more. Figure 2. Habito uses constantly updating textual messages to sustain user engagement. Our hypothesis was supported. We found that users take less time to come back to Habito following an interaction with a novel message compared with a message they had seen before. Furthermore, interacting with persuasive messages as opposed to merely informational messages would make them take a walk in a shorter period of time. Social translucence. The second strategy suggests: If persuasive technologies are not successful in the long run, what if we push the responsibility to families and other strong social ties? This implies a change in perspective. Rather than thinking of such technologies as persuasive, we think of them as socially translucent, where the goal is to raise awareness of one another’s behaviors. Behavior change in this sense is expected to happen not as a result of the technology, but rather because of the often-ingenious forms of nudging families employ (e.g., a mother putting some tape over the light switch so her children don’t use it every time they come into the room). While social influence is one of the most common approaches employed both by research prototypes and commercial products, it is often reduced to simplistic techniques (such as competition) that are mediated only through the technology. In our work we attempt to reduce the role of technology in the behavior-change process to two important attributes: visibility—allowing information about the individual’s behaviors to be seen by others—and mutual awareness—raising the individual’s awareness that this information is visible to others (“I know that you know”). The combination of these two attributes is expected to lead to compliance and feelings of accountability regarding one’s behaviors . Most important, technology’s role is reduced to one of mediation; it is the communication and coordination practices that families establish that define the path to behavior change. Consider for instance Social Toothbrush, a prototype developed by Ana Caraban as part of her master’s thesis (Figure 3). The prototype senses the frequency, duration, and performance of the user’s toothbrushing practices and provides information both in real time and during subsequent use, as does any other personal informatics tool. 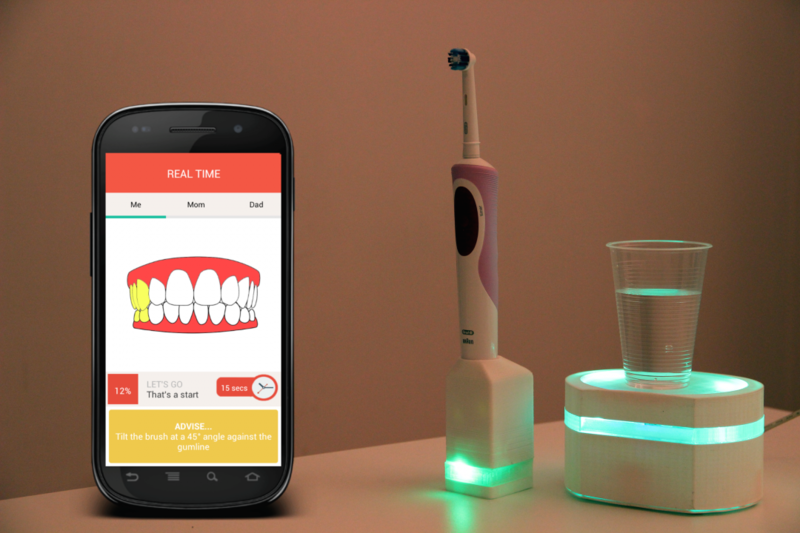 More important, a minimalistic glanceable display (in the form of a colored light in the lower part of the prototype) allows a person entering the bathroom to know whether the toothbrush has been used during the past couple of hours. Similarly, Donovan Costa in his master’s thesis developed Hydroscale, a prototype that senses the user’s water-intake practices in the workplace and reminds them when it’s time to have another sip. The fact that the display is visible to everyone in the vicinity plants the seeds for playful nudging and discussion over the user’s water intake. One may as well choose to adhere to recommended water-intake practices to avoid this form of nudging. This strategy certainly poses significant ethical questions: Is it likely to raise conflicts within families or between individuals, or is it the first step to the creation of norms and adherence to them, eventually even leading to a possible reduction in conflicts? Figure 3. Social translucence as a means to behavior change: making our behaviors visible to others makes us more likely to adhere to healthy ones. Supporting action. While today’s physical-activity trackers and behavior-change technologies all inform users about their levels of physical activity, they do little to assist them in implementing new habits. CrowdWalk tries to combat this by proposing walking activities one can do from the current location. Activities are produced by users and can be tied to breaks (e.g., “walk around the campus—it will take you 15 minutes”) to commuting (e.g., “walk downtown rather than taking the bus”) or to practices that involve walking (e.g., “try to maximize the distance walked while shopping in the supermarket”). While CrowdWalk proposes walking activities to users, it doesn’t nudge them to carry out these activities (see  for a different approach). While this avoids , it suffers from possible attrition as individuals forget or lose interest in the proposed activities. How to assist users in transforming these walking activities into daily habits is a key question for such tools. We proposed three directions, but also considerations, for the design of behavior-change technologies that sustain users’ engagement. The first direction implies that behavior-change technologies have to fight for users’ attention. In a life of constantly fragmented attention filled with distractions and changing priorities, how do we design technologies that do not overwhelm the user, and yet do not disappear in the muddle of daily life? The second direction implies that social relationships may be more effective in inducing behavior change than human-technology ones. The question posed to us designers is how to integrate humans and technologies in supporting the behavior change process in a way that is ethical, effective, and socially acceptable. The third direction implies that assisting behavior change is not only about reminding people, but also about telling them how. Keeping to a healthy diet is far easier when a clear, step-by-step process is available. As designers, we should ask, does the technology suggest clear actionable goals that are tailored to the user? Does the technology have the agency to stress the implications of these goals? Last but not least, we suggest that engagement is key to behavior change. In fact, the majority of early studies on behavior-change technologies overlooked users’ engagement, focusing directly on the final outcome: whether behavior change took place or not. We argue that understanding how people engage with behavioral feedback is an important gateway to the invention of more effective behavior-change strategies. For instance, in a recent study we found that contrary to conventional wisdom that portrays behavior change as the result of deep knowledge about one’s own behaviors, users truly lack the interest to reflect on past behaviors. Instead, more than 70 percent of the long-term usage of our tracker related to glances—brief, five-second sessions where users called the app to check their current activity levels, with no further interaction . Consequently, we should question the current paradigm of deep reflection underlying most of today’s technology. Instead, we should ask: How can we maximize the impact of these glances on individuals’ behaviors, and how can we leverage these glances to act as proxies for deeper engagement with the feedback?